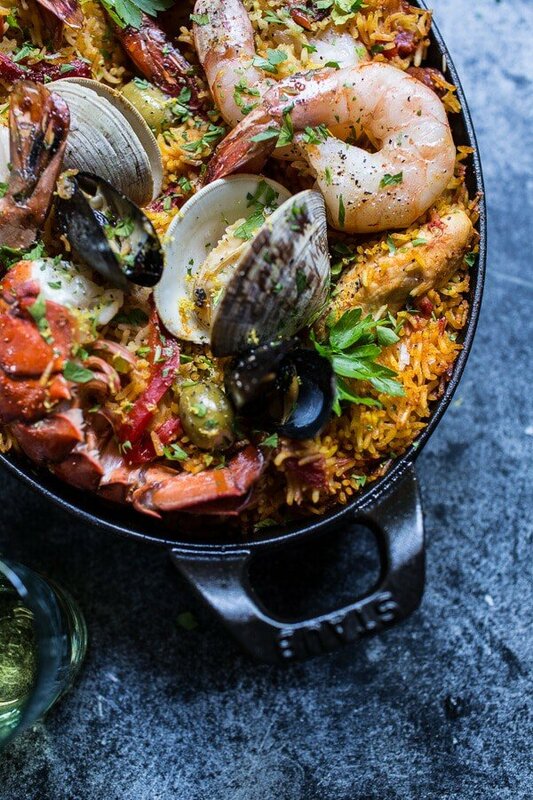 Skillet Grilled Seafood and Chorizo Paella. I made us a big skillet of awesomeness. And I did it all in one pan… without even heating up the kitchen. Although, now that I say that out loud I am silently thinking to myself that at least for me, up here in the mountains, it’s really not that hot out, like at all. 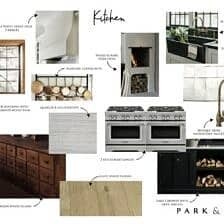 Honestly, I wouldn’t mind heating up my kitchen right about now. I mean, I am highly embarrassed to admit this, but I totally have my heater blowing on my legs right now. Don’t judge, it’s cold and stormy here and I am about to head out to bring the goats in from the field, and well, it kind of gives me chills just thinking about it. I really should have brought the goats in like an hour ago, but I am procrastinating going outside by telling myself that I need to finish writing this post first. Is it just me or has it been on the colder side this summer? Even when I was in Cleveland visiting family it was only in the low 70’s. Now come on, I need at least 80 degrees to be extra happy and in my shorts and t-shirts. 70 is more like leggings and a sweater, and the current 45 degrees I am experiencing in Colorado, well that’s more like socks, leggings and a BIG cozy sweatshirt… maybe even some serious snuggles with a blanket. Sidenote: I was recently asked how I survive living where I live when 85 degrees is my ideal temperature. The honest answer, it’s a struggle! If it weren’t for my family and the fall (I adore an awesome, cozy fall and the months of September, October, November and December are awesome up here), I might not be able to get through the rest of the year. Completely random sidenote # 2: Since I seem to be in the procrastination mode… and I am oh so easily distracted… I decided to be weird and watch the running of the bulls on snapchat. Oh but hey!! The running of the bulls kind of fits in with my Spanish themed recipe, right? I mean, not really, but the running of the bulls is done in Spain and paella was created in Spain, so hey, it kind of justifies my distraction and ties it in with this post, you know, like background research. 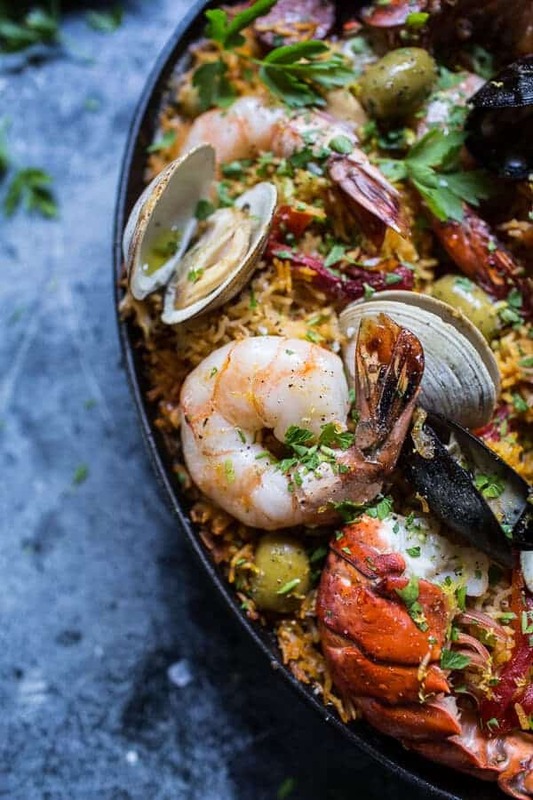 Not gonna lie, I’d chose this skillet grilled seafood and chorizo paella over running with the bulls in Spain any stinkin’ day. Just sayin. Can you believe I made this whole thing on the grill, and dirtied just one dish, one cutting board and one knife?!?! I was SO happy about the minimal mess since lately cleanup around here has been a 2+ hour project and the thought of cleaning even one more dish, or vacuuming up another crumb or wiping more stickiness up off the floor is pretty much daunting. Clearly not only the flavors of this dish were welcomed with open arms, but also the simplicity of this dish! Bring on more easy clean up meals… please!!! 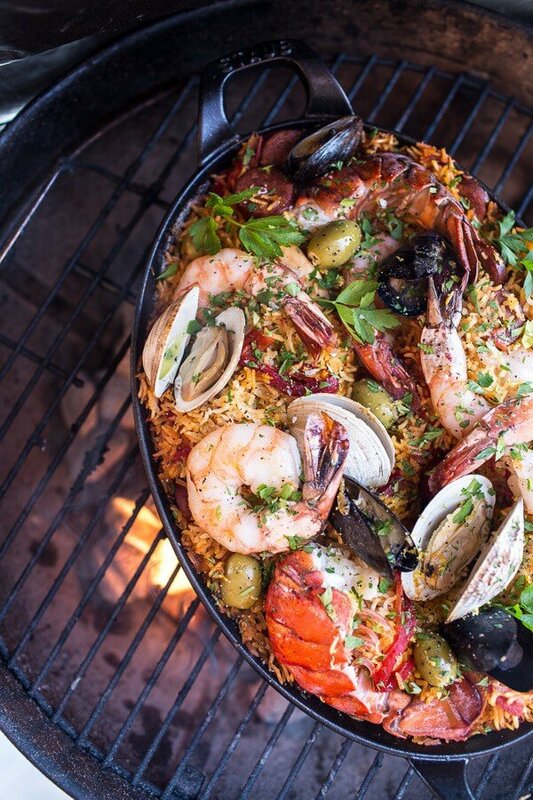 Making paella on the grill is really just the same as making it on the stove. You simply need to try to keep the heat of your grill a consistent temp and you’re good to go. Bonus, you also get a little smoky flavor from the grill as well!! And if you don’t have a grill? Well don’t worry, you can totally just make this on the stove-top. Works great both ways. For my paella, I used a mix of chicken, chorizo and seafood. You can do all three like me, pick your favorites or leave them out completely and make a vegetarian version. It’s totally adaptable to your personal taste buds. For the seafood, I used a mix of a lobster tail, jumbo tiger shrimp, clams and mussels. It was the perfect combo if you ask me and made for a really pretty dish too!! I also finished my dish off with a drizzle of truffle oil, which I kind of think was awesome, but I do realize that truffle oil is a bit pricey, so only use it you have some. OH and I didn’t just use plain green olives. NOPE. I used blue cheese stuffed olives (my favorites are the DeLallo brand) cause I mean, a little cheese never hurt. <–Truth. Double OH, if you’re out to impress someone, make this dish, it’s definitely a show stopper! Place a very large cast iron skillet (it should be at least a 12 inch circle or oval skillet) on the grill grates. Allow the skillet to heat with the grill. Once the skillet is hot, add the olive oil, onion and garlic. Season lightly with salt + pepper and cook about 3-5 minutes, stirring often or until the onion is soft and sweet. Add the chorizo and cook until just browned, about 2-3 minutes. Add the tomatoes (crushed by your hands if using canned), their juices and roasted red peppers. Continue cooking another 5 minutes. Add the wine to deglaze the pan and then stir in the rice, cooking until toasted, about 3-5 minutes. Slowly pour in the chicken broth and give everything a good stir. Slide in the chicken, green olives, paprika, another pinch of salt + pepper and a good pinch of saffron, stir gently to combine, cover tightly with the skillet top or tin foil and then place the lid on the grill. Grill covered for 15 minutes. Meanwhile, toss the seafood with a little olive oil, salt + pepper. After 15 minutes of cooking on the grill, carefully remove the skillet top or foil and add the seafood to the skillet. Cover again with the top or the foil and return the grill lid, continue cooking another 15 minutes or until the seafood is cooked through and the rice fluffy. Remove the skillet from the grill and drizzle the dish with lemon juice. If desired drizzle with white truffle oil as well and season lightly with salt + pepper. Garnish with fresh parsley. EAT! *You can also make this on your stovetop, just follow the directions and cooking times as directed above. *Wooden Spoons used in this post are from Earlywood Designs. 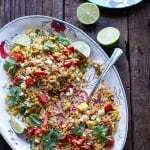 Summer Grilled Mexican Street Corn Quinoa Salad. 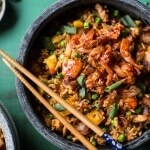 Kimchi Chicken and Bacon Fried Rice. Apple Cider Chicken Marsala with Wild Rice Pilaf. 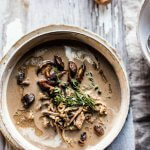 Cream of Mushroom Chicken Wild Rice Soup. I agree Tieghan! This is a big skillet of awesomeness and not a lot of cleanup which is perfect for summer! WIsh I could send some warm weather your way from the Jersey shore! Keeping my fingers crossed it gets warmer there! 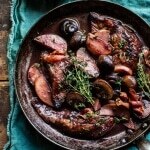 This dish is gorgeous…I’m going to make it this weekend. Is Spanish chorizo the one that is cooked and dried like pepperoni? I always get the two kinds confused. Yup, thats spanish chorizo! I get confused too! Thanks Lisa! Hope you love this! I think the weather there sounds awesome! It’s been a hot and humid summer down South! I’ll send some warm your way if you send some cold my way :). 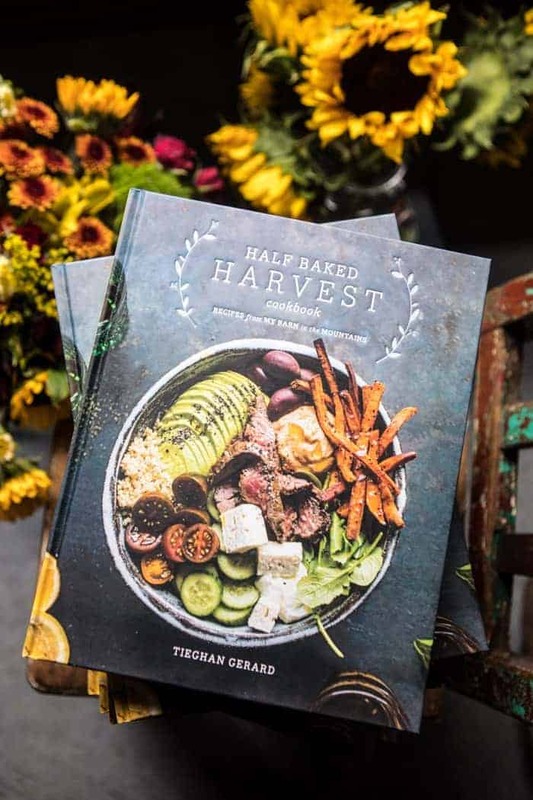 Love this one pot masterpiece… especially since it’s cooked on the grill! 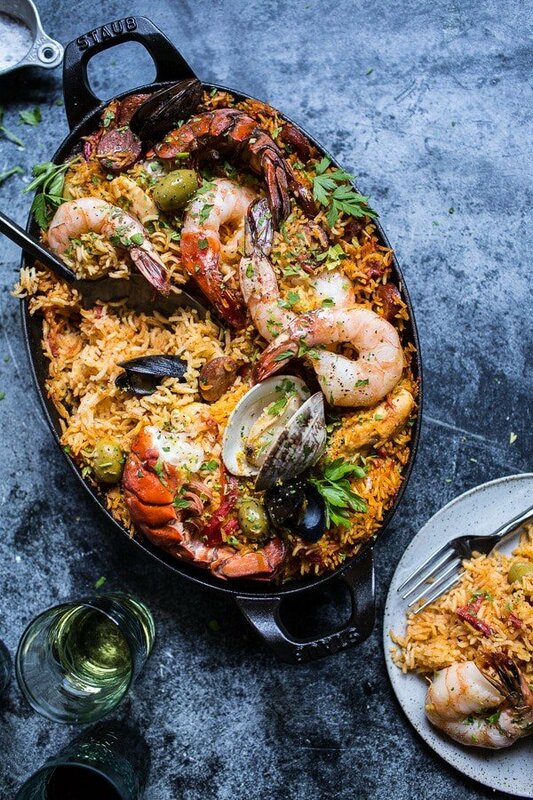 When my husband and I got married we served paella. We cooked it ourselves, as well as all the rest of the food and the wedding cake as well. And then we went of to honeymoon in Spain. 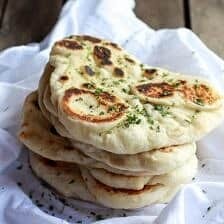 This recipe has just brought to me the happiest memories! whoa! Go you guys, that must have been a lot of work!! Thanks for the sweet comment, hope you enjoy the recipe! I love paella and it has been SO long since I made it myself! Yours is beautiful Tieghan!! 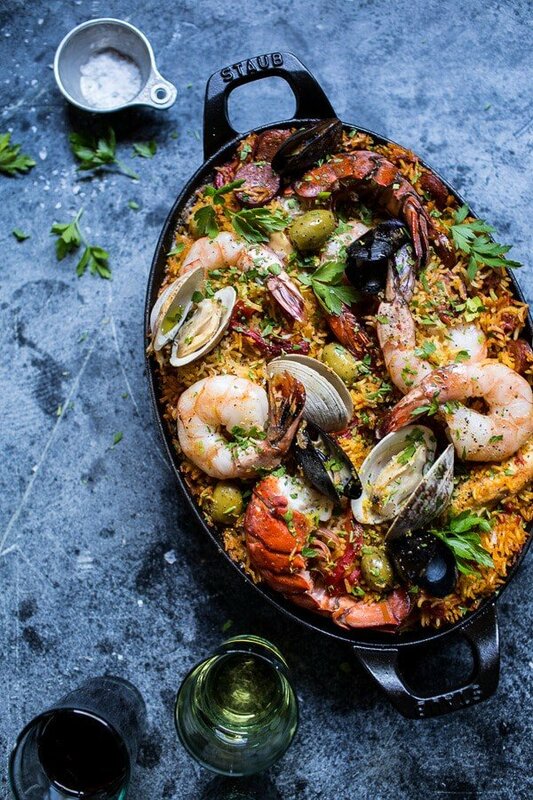 I have a soft spot for paella! It’s the perfect summertime food for cooler nights. I cannot wait to try your version. I’m sure it tastes as beautiful as it looks! You truly are an artist! Thank you so much, Sydney!! Looks better than what they serve in Spain! I think skillets are the best cooking tools in the world! This looks amazing. 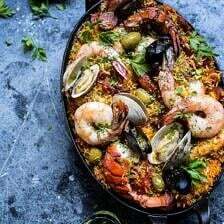 Paella is so so good and your version looks excellent. I hear you regarding the dishes. Sometimes I look around my kitchen after cooking and think, “what did I do! ?” Was that REALLLY worth all this mess? Fortunately, it is worth it most days, but some days, oy! Thanks Laura! Hope you are having a fun weekend! Here in the Pacific Northwest it has been insanely hot, like 9 straight days of 90+ degree weather in June, which used to never happen until August. Everything is in a drought. Everything is early. It has been hard on some of the crops. We are not as badly off as California, but the mighty Columbia River is looking mighty low, and the salmon runs are in danger. Anyway, I’d trade for some cool, but we mostly need rain. I love hearing about your goats, and I love your photos and recipes. Hope you get warmed up. I think there are warm weather folks and cool weather folks, and it is hard to be in the opposite kind of climate sometimes. Hey Terry! Hoping you guys get some rain soon. As much as that weather sounds amazing, I know the rain is needed!! 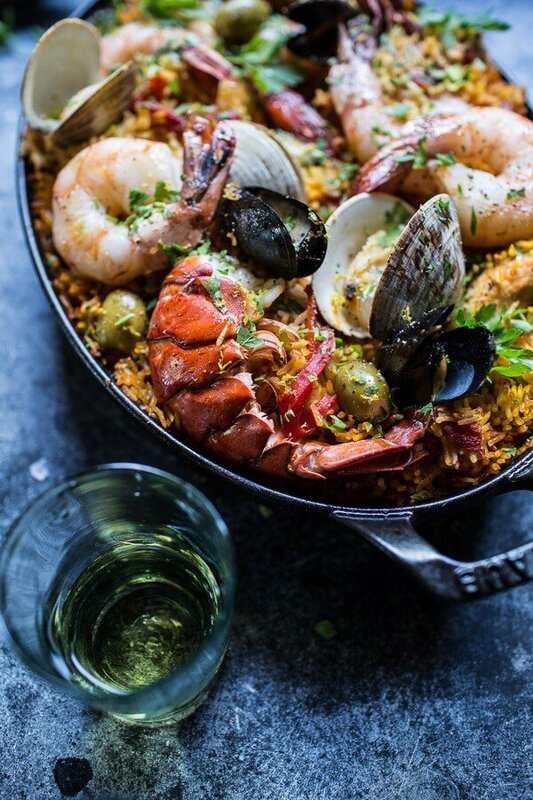 I love paella, and this dish looks so amazing and delicious. All that seafood! How can I resist? I can’t wait to give this a try! Thanks so much, Andrea! Hope you are having a great weekend! This looks delicious! I think it would be awesome to serve to company, and it’s perfect for dinner outside with a bottle of wine. Love these photos too! Yum! I’ve made quite a few of your recipes and all are amazing. 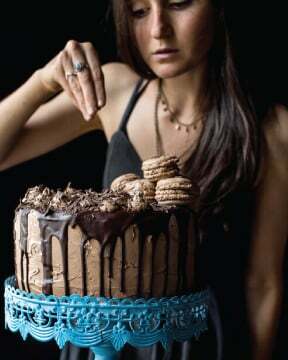 I’ll be making this one next weekend! Love your site and your food is delish!!! Awe, thank you! I hope you love it! Vicki, did you ever make this paella? Wondering how it turned out? Looks really tasty plan on gathering the ingredients soon, quick question can i substitute the chorizo for Kalbasa almost like a low country boil type. I love the minimal clean up dishes too, so I was ecstatic to find your recipe here. I have one question, if we wanted to use brown rice.. how much would we augment the rice cooking stage? Or what would you suggest. I like the flavor of brown rice but it’s such a pain to cook. Thanks in advance, I can’t wait to try it! Honestly, I have such a hard time with brown rice. It takes forever to cook for me. I would take on probably 20 extra minutes or so, but I cannot be sure. Let me know if you have any other questions, hope you love this!! 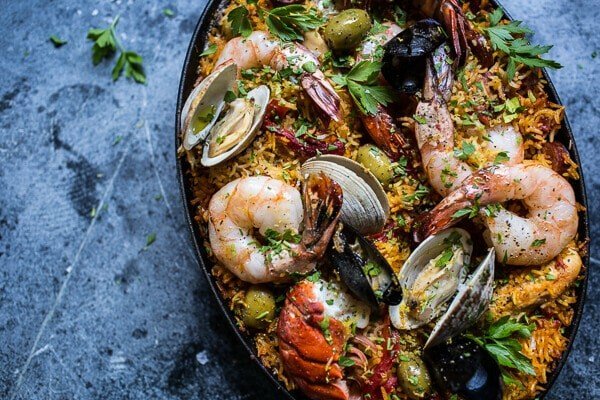 This paella looks amazing!!! I can’t believe you did it with the grill! I’m so sad my paella pan got ruined after my first attempt. Will try this once my new paella pan comes! I’m curious about the last remark from reader that her paella pan was ruined. Did this happen on the grill or for another reason. I have a iron paella skillet. Will it withstand the heat of the grill? I’ve only used it in the oven. Thx! This looks amazing and I’m always looking for projects w my wife, and we will do this over the weekend. One question, is the rice actually made in the skillet? Also when you state ‘toss the seafood’ is this like seasoning it? Sorry for the ignorance. This looks amazing!!! Must try it. Hi! I am not sure about the temp, maybe 400 degrees F. Coals in an even layer. Let me know if you have any other questions! Thanks! Your recipes are fabulous. What size is the Staub pan you used here? Is it the Staub 12.5″ x 9″ Cast Iron Oval Baking Dish? Please let me know. 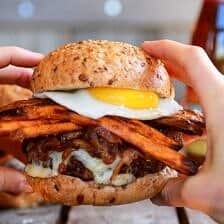 I am trying this recipe on Friday. Hi Ann! Yes it was the 12.5″ x 9″ Hope you love it!! Did you make this in Colorado? I love paella and tried to make it for the first time earlier this month, but had some issues due to the altitude here. It’d be awesome if your recipe were altitude-friendly! HI Aubrey! Yes, I did make this in CO and it worked great! Let me know if you have questions, thanks! Really not Paella rather chicken and rice with seafood. Brown the chicken first otherwise its rubbery and pale. Remove and add chorizo, the fats and spices will render out a bit flavoring the soffrito. Remove chorizo and add aromatics, soften then add tomatoes. the rest of the process you describe should be ok. Senia or Bahia rice is preferred, bomba rice is more likely in Valencian versions. Hi Tiffany! Cook everything over medium-high heat. Cooking time should be around the same, but I cannot say for sure since have never tried it. Let me know if you have questions. Thanks! ? Thank you…. looking forward to trying it! 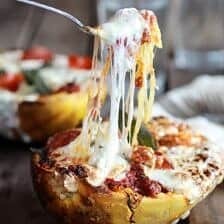 I am making this on Friday and could not be more excited — quick question on the tomatoes. Whenever you say crush by hand, and use juices. Do you mean juices from crushing, or leftover juice in the can? I know too much liquid in this dish can cause a disaster, so I wanted to double check. I just made this tonight and it was absolutely amazing! How would you adjust the recipe if you were only cooking the rice? Would you reduce any of the liquid or add any flavorings such as clam juice. This was a delicious treat and would like to make it a more regular meal that is less expensive. 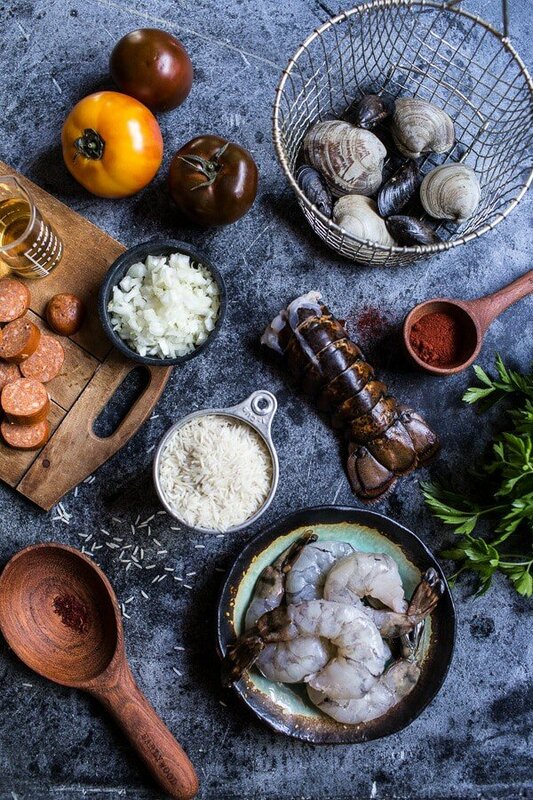 For example doing only lobster tail and one meat or chicken/chorizo and one smaller seafood. Thank you! Just whatever recommendations you may have would be appreciated. Hi Alma! So happy you enjoyed this recipe! If you wanted to cook this minus the meat I would not change the liquid in the recipe. The liquid is for cooking the rice, so I think leaving it the same will be just fine. Let me know if you have any other questions. Can this be made slightly ahead and reheated before serving? This sounds delicious!! I was wondering if I could make this on the stove in my dutch oven if I don’t have a cast iron skillet?